Since his earliest childhood, Clement GAUD is passionate about watches, chronometers and other instruments of measurement of the Time that he discovers in the universe of antique shops where he grows, thus forming his eye to the quality of the beautiful objects. 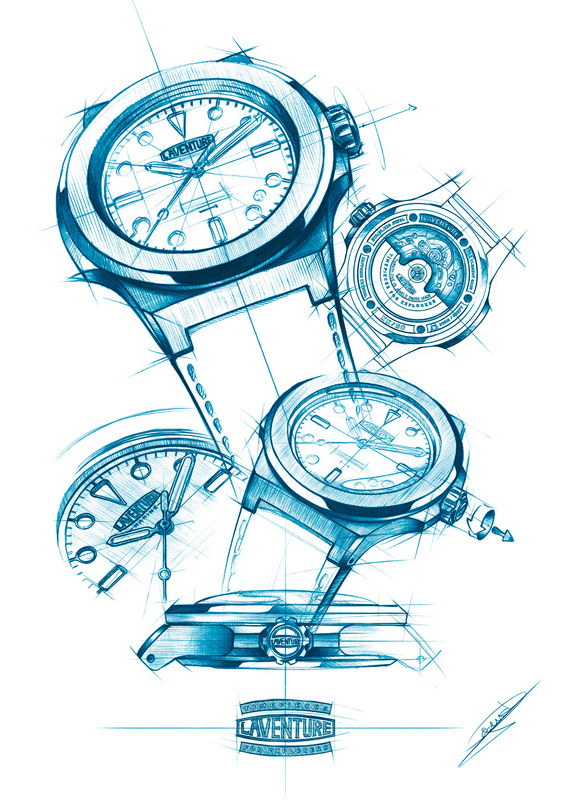 His design degree in his pocket, it is natural that he will work in Switzerland, in Neuchâtel, in a watch design agency where for five years, he acquired a solid experience and expanded his network working for the biggest names Swiss watchmaking. LAVENTURE is a universal word that elicits dreams and recalls memories of numerous imaginary expeditions, explorations, discovery and extraordinary voyages. It responds to a dream of freedom and adventure, with the fervent desire to get as close as possible to nature, exploring its universe, for a simple love of discovery. The first creation of this young brand will be named "LAVENTURE MARINE" and the second "LAVENTURE SOUS-MARINE ». The idea is to explore each year with small limited series an imaginary related to adventure, exploration ..
With this second limited edition, LAVENTURE pays tribute to the underwater world and is inspired by the diving watches of the 60’s, which have marked the history of watchmaking. LAVENTURE’s second timepiece is a contemporary reinterpretation of these inspirational tools. Truly an instrument for the adventurer who appreciates fine objects, LAVENTURE Sous-Marine, a watch of character, makes a sort of link from past to present and tradition to modernity. To earn the stamp Swiss made, a watch must satisfy the minimum 60% Swiss value requirement. A LAVENTURE watch is more than 95% Swiss value. Only sapphire crystals are not produced in Switzerland. This quality requirement ensures that the goal of achieving beautiful products is met. Truly a local production with Design in Neuchâtel and Conception and Production in La Chaux-de-Fonds: these two locations separated by only 18kms. Passionate craftsmen transform quality materials. A limited edition for an exclusive product, LAVENTURE watches are limited to 50 pieces, numbered with a beautiful and deep engraving on the background. By creating one new limited edition model per year, the vintage LAVENTURE is established.